US lecturer famed for being mistaken for British retailer is star of quirky Christmas campaign. Every year, John Lewis, who has owned the handle @JohnLewis since 2007, receives thousands of tweets from people who incorrectly think they are contacting the department store. Last year alone, he received 50,000 tweets. Lewis’ witty responses, often containing the hashtag #NotARetailStore, have made him a cult hero. Working with The Romans, Twitter UK is celebrating Lewis’ story in a Christmas campaign named after his signature hashtag. The film is shot on location at his home in Blacksburg, Virginia, and shows him doing what he does this time of year – dealing with wayward tweets aimed at the retailer. It pays homage to the tradition of the John Lewis Christmas ad, with references to previous years' campaigns for fans to spot, including a telescope, a miniature moon ornament, Monty the penguin and Buster the boxer. The spot uses the tagline: "Join the conversation." Lewis said: "I think it’s hilarious that people mistake me for the UK store and I do my best to direct them to the right place. I see a massive spike in tweets at this time of year and I always watch the John Lewis ad, especially as it becomes a huge part of my Twitter conversation. I find it absolutely fascinating that Twitter UK has chosen me to star in their Christmas film. Hopefully, people will be kind about my acting skills; I am no Elton John but, who knows, maybe I’ll get tweets about my own film this year." 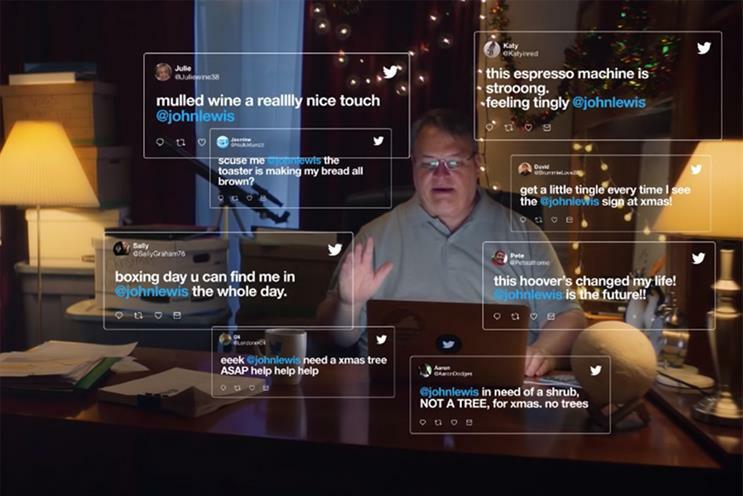 Joe Mackay-Sinclair, founder and creative director of The Romans, said: "The perennial story of @JohnLewis patiently replying to tweets is one that has delighted the UK for years and truly captures the spirit of Christmas. We’re very pleased to have been able to finally let John be the star of his own campaign."